Casa Helena is a spacious detached villa, situated in the exclusive development of Las Coloradas near Playa Blanca & the famous Papagayo beaches. 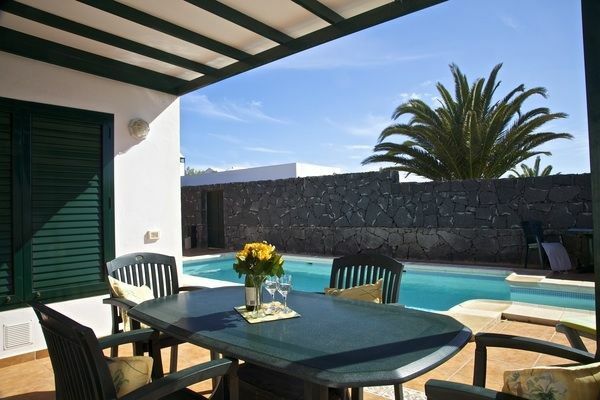 The villa is situated in a quiet location & is completely private with a walled garden. It has the benefit of large rooms furnished to a high standard & lots of outside space. The pool was built by the present owners to their own specifications. The villa also has a patio giving lots of opportunities for dining outdoors. For sun worshippers, there is plenty of space on the terraces & garden furniture to provide the perfect environment for relaxing in the sun. The property has shutters on all the main windows providing extra security & ventilation. The lounge has comfortable seating, TV with satellite channels, a CD & DVD player with lots of play station games & videos to keep children - & adults entertained. Comfortable and quiet place perfect to relax and chill out. The booking process, and especially the communication from Vera, was the best we have had over many years of arranging our own rentals. We had been to the area before, so we knew what we were expecting, but all instructions were clear and 100% spot on. The house is everything it says and more.....we would not ask for even one thing to be changed.....and there is no doubt we will return the next time we stay in Playa Blanca. The one caution for others would be it is a 20 minute walk to the marina, which we knew in advance and indeed wanted, but it would not be for everyone.........however it is only a 5 minute drive or an easy taxi for those who do not fancy the walk. I love the walk over to Rubicon Marina along the promenade. The views over to Fuerteventura are spectacular. My favourite time is early evening when the sun is setting. We have a number of restaurants at the marina where we like to eat & it feels very safe walking back after our dinner. It is only a few minutes in the car for those who prefer to drive. We had previously been to Los Coloradas and stayed in a hotel (at the bottom of the hill) and loved the area. It is very quiet - which was exactly what we wanted but if you want to be 'in the middle of all the action' it's about a 30-40 minute amble to the more commercialised end of Playa Blanca (which we walked to every day). The Marina is a short walk and has some lovely places to eat and drink....we ate out for most meals and they get cheaper the closer you get to the more commercialised end of Playa Blanca but we didn't think the prices were bad anyway. If you walk to the Marina or Playa Blanca on an evening it is worth having a torch as the lights are often out and it is very, very dark.....but don't let this put you off. The HiperDino Supermarket was about a 15 minute walk and sold all the essentials.There is also a Supermarket in the Shopping Centre a 5 minute walk away which also has shops (ceramics, gifts, clothes), bike hire, bars and a couple of restaurants which has lovely meat fruit and veg but is slightly more price wise than the HiperDino. The beaches are a 20 minute or so walk away but you need good footwear and to be steady on your feet......if you've a car you can also drive. They are lovely and aren't to crowded at this time of year but there are often nudists so if this offends you, be aware. We didn't have a car but if you did you could park on the main road up the hill from the villa but we pre-booked a taxi whilst in the UK and only paid £32 for 2 people to and from the airport as we just wanted a week to chill by the pool, amble along the sea front to the marina and Playa Blanca resort. It really is a place you can choose to do as little or as much as you like. The owner was so lovely throughout the whole process and along with sending information, had information about the area in the villa. We would recommend a stay here....in fact we'd like to stay all winter! Nice villa, decent size pool, and some real foliage! Well-equipped kitchen and plenty of CDs and DVDs in the unlikely event the weather's not great. Very good location - peaceful, and walking distance from local supermarket and bars. About 15-20 mins to the restaurants in the marina, but it's a pleasant enough walk along the clifftop promenade. Best of all, only 15 mins walk from the glorious Papagayo beaches. Easy to park just a short stroll away. Only about 20-25 mins from the airport. A great place to chill out. Top class.Better than expected.Close to all and yet far away.I would think having a car a big plus.Facilities at Villa home from home and even better.Saturday market at marina a must.Great places to eat locally and in Playa Blanca.All keenly priced.Local supermarkets well stocked so cooking up a feast at home a real delight.If you are 21 and want to party,go elsewhere.This place is for peaceful chillout or a family holiday.Dealing with owners a pleasure and all your dreams and expectations will come true here.Booked again for May 11,and cant wait.. This property was exactly as described on the website . The quality if the fixtures and fittings was excellent, it was clean, bright, well maintained and equipped with everything needed for a wonderful holiday. The area was extremely quiet when we were there (end May start June) the restaurants were empty, the only time there were more than four people in the bar was for the cup final. If you want a quiet restful holiday this is for you, if you want night life and noise you won't get it here. The regular bus and taxi service to Playa Blanca is effecient and cheap if you want to have a night out. Our villa is situated in Las Coloradas - a seaside hamlet 10 minutes walk from the famous Papagayo beaches. There is a small centre with restaurants & shops & a play area for children. The Marina with its market, supermarket & larger restaurants is a few minutes by car & Playa Blanca is only 5 kilometres away. Here you will find the excellent Dorada Beach with sunbeds & watersports - perfect for children & the ferry port to the neighbouring island of Fuerteventura. Play Blancs also has a large selection of restaurants & specialised shops.